When it comes to different foods, each has its own makeup of nutrients. Historically, vitamin deficiencies were a lot more common in the United States than today, and many of the ways we prevent deficiencies today are so ordinary that we don’t even know we should ask why things are done a certain way. So let’s ask why! 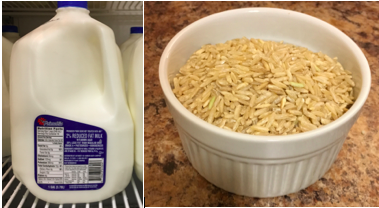 Why is it important to cook rice until all of the water is absorbed? The rice grain has different parts to it, including the bran, germ and endosperm. B vitamins are found in the bran and germ, which are removed during processing to create white rice. This means the B vitamins are lost; as a result, we add them back through a process called enrichment. Scientists considered two main points when creating the best way to enrich the rice: (1) B vitamins are water-soluble, and (2) rice is cooked with water. These important factors led to putting the rice into a large, vapor-filled tub. The vapor contains B vitamins, which sticks to the outside of the grain.This is why it is important to allow all of the water to absorb into the rice grain when cooking…because the B vitamins get absorbed into the grain along with the water. If there is any extra water that is poured off at the end of the cooking process, some of the enriched B vitamins are washed away. Why is milk not usually sold in clear containers? Milk naturally contains a B vitamin called riboflavin, which is important for many various cellular reactions in the body. Riboflavin is sensitive to light, being easily broken down when exposed to UV light, sunlight and fluorescent lights. Thus, when milk is packaged, we find it in opaque plastic jugs at the grocery store and in small, paper cartons at schools. Sometimes we just accept things as they are, but it’s fun to ask why things are the way they are, too.